Since reading about Random Bakes of Kindness on @vanessakimbell blog I have tried to do one every month and this month's effort is for probably the most deserving cause yet. My wonderful nan recently passed away, the post can be found here, and the doctors and nurses who cared for her during her short stay in hospital were nothing short of amazing, both to her and to my family whilst we stayed with her. Enough to restore your faith in the NHS! To say a small thank you I wanted to take them some baked goodies and made some cupcakes, a tiramisu cake and a lemon drizzle cake. Now this probably sounds like a very large Random Bake of Kindness, however I was helping my sister make a three tier celebration cake and 100 cupcakes for her work's 10th anniversary party so it wasn't very difficult to make enough extra batter and play with the flavours where necessary. For the tiramisu cake I used a 10oz mixture of vanilla sponge cake. 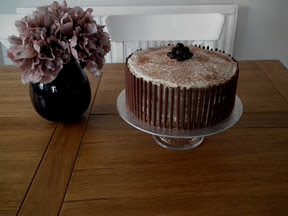 See the full recipe here http://sarahskitchendiary1.blogspot.com/2011/10/tiramisu-cake.html?m=1. Unlike my last blog post I decorated the edge with chocolate coated biscuits and the top with a few chocolate covered coffee beans. 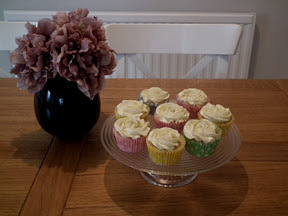 http://sarahskitchendiary1.blogspot.com/2011/10/bridesmaids-cupcakes.html?m=1 However due to the season I substituted the surprise strawberry for a spoonful of homemade raspberry jam and topped with white chocolate icing. Made in the same way as the previous post but adding 100g of slightly cooled melted white chocolate at the end. I had to make a lemon drizzle cake as it was my nan's favourite. I've never posted the recipe before but it's very simple. I used about 4ozs of sponge batter before the vanilla went in and added the zest of one lemon instead. Once cooked but while it was hot and still in the tin I made holes all over the cake with a skewer and poured over a mixture of the juice of one lemon with granulated sugar mixed in. 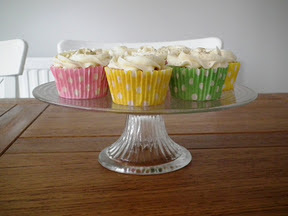 If a cake isn't going to have icing in the middle I always use these fab liners from Lakeland. They save lining the tin, transport well and look professional if it's for a gift. Win win! How lovely to hear something positive about our NHS. LOVE The photo's they look amazing !!! What an amazing gift. They will have been really touched at the effort that went into those! You know, it's a hard job and you have probably really lifted some spirits. 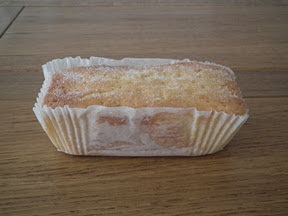 Your Nan had good taste - lemon drizzle is the best! Thanks both. They really were excellent and Lou I totally agree with lemon drizzle being the best. I saw a recipe for a lime drizzle recently which I'm a little confused by but might have to try!